Graduating with a BA from the University of Minnesota at Winona, Courtney Armstrong was raised in Minnesota but has been 38 years in Denver being a Western gal. As a board member of the Mountainside Art Guild, she was the computer coordinator/ photographer and a frequent participant in all guild shows. She also worked in the graphic arts field in photography (8yrs) as a retouch artist, played around being a musician for a while, finally settling as a draftsman in Electrical engineering for 20 years. She has been an artist all her life. Courtney’s first award was at the Chatfield Western Days art show- no children's section so at 16 yr.s old she showed with the adults and received an Honorable Mention. She has had three solo shows in Denver, participated in five to six shows per year in the Denver area and won awards from Honorable Mention, Award of Excellence to first and second placings. Courtney has enjoyed watching artists grow for the last eight years teaching beginning classes in drawing, pastel and watercolor. She enjoys teaching a great deal and especially loves drawing - it is the foundation of art and thus the most important part. Have a fun painting experience with your girlfriends or sisters on a bright Sunday afternoon! 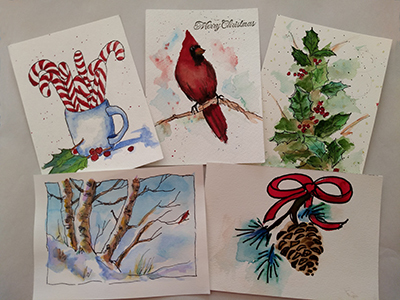 Crossings is offering two watercolor classes with Courtney Armstrong, with unique holiday designs. You will bring home five charming cards from each class. Classes meet Sunday, Dec. 2, OR Sunday, Dec. 9 from 1-3pm. Courtney has new cards for her two classes this winter. Classes move just quickly enough, with lots of laughs and conversation. 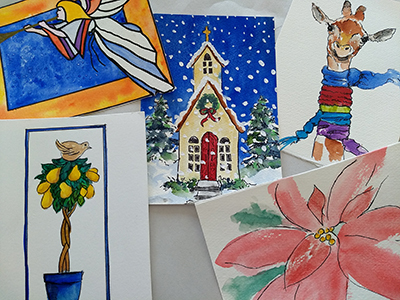 Try out this artform if you are new to watercolor, or use this class to brush up on your skills. Teens 16 years and older are welcome, as are co-workers, mom groups, dad groups and the aforementioned girlfriends and sisters.